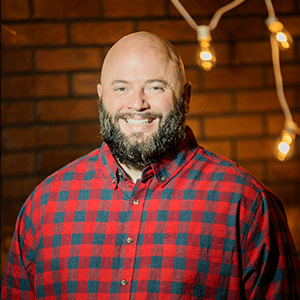 Benjy is the Music & Media Director for River Ridge Church. He joined the staff after feeling that God was calling him to give more time to the church than he was able to give while working full time. Benjy has a gift for leading worship and can be found using his voice and musical talents almost every Sunday. He is passionate about seeing people engaged in worshiping God through the ministry of music. Benjy grew up in Paradise, WV, graduated from Poca High, and attended the University of Charleston where he studied Music Administration. Before joining the staff, he worked at the Toyota plant in Buffalo. Benjy enjoys being outdoors. He loves camping with his family, fishing, hunting and enjoying God’s creation in any way.